Ni no Kuni II follows Evan on his quest to build a kingdom and become the King he was destined to be. Building alliances and expanding a kingdom is no simple matter, though-Evan and his group must manage a sprawling network of favors and rewards and battle a great many foes as their adventure unfolds. The Official Collector's Edition Guide to Ni no Kuni II: Revenant Kingdom makes keeping track of everything as simple as can be. With this book by your side you'll experience all the game has to offer and be guaranteed to have a prosperous kingdom! -- Quest Guide: Let us guide you through Evan's adventure with a beautiful, in-depth walkthrough full of exclusive artwork and illustrated maps. In addition to the Main Quest, every Side Quest, Errand and Skirmish is fully covered to ensure that you don't miss a thing. -- Bestiary: Discover everything about the many exotic foes that Evan and company encounter on their travels. From the smallest Goo to the greatest Dragon, you'll find their statistics, strengths and weaknesses as well as strategies that let you deal with them easily. 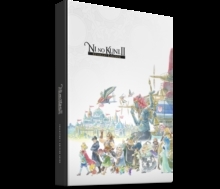 -- Kingdom Building: Building your kingdom is a huge part of this adventure-the size and influence of your kingdom affects almost everything you do in Ni no Kuni II. You'll want your Stores to be full and your Coffers to be overflowing, and this book will provide the most efficient ways to keep expanding at full pace. -- 100% Completion: If you want to see and collect everything in Ni no Kuni II then you'll find this guide invaluable. There are many lists to fill, Higgledies to rally, Tainted Monsters to beat and Citizens to recruit, and we have them all covered and organized. If you want the Platinum Trophy, this is the only source of help you'll need. -- Adorable Artwork: The world of Ni no Kuni II was built upon the amazing artistic work of Yoshiyuki Momose, and an incredible amount of sketches and concept artworks were created to develop the game's many wondrous locations and characters. This book is bursting with artwork, as we aim to enrich your time sent in this world as much as guide you through it.